Normally I wouldn’t do an update this close together, but this isn’t a regular update. This is a special fish that I’ve welcomed into my fishy family: Mr. Waddles. He came to me from a friend on my home fishkeeping forum, and he has a troubled past. Mr. Waddles shared a 29 gal tank with other goldfish of various ages, most won at fairs. The owners of this tank didn’t take care of it at all. Instead of finding out why some of their fish would die after a couple of months, they would just buy a replacement. This happened for years until they just stopped replacing the fish. Mr. Waddles was the last one they put in there and the last one left standing. Enter Jes, a fishkeeper who with a heart of gold and a love of kids. The family who owned Mr. Waddles had a young girl who became very attached to him. Fearing that he would die and their daughter would be heartbroken, the family asked their friend, Jes, to help them get the tank back in shape. She reluctantly agreed but had no clue how bad it was. 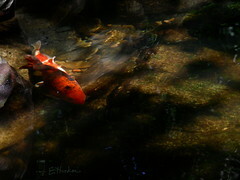 Knowing that I keep and love goldfish, she contacted me before even seeing the tank to ask for goldfish care tips. I tried to prepare her for how bad that filter and tank could be, but it shocked even me. 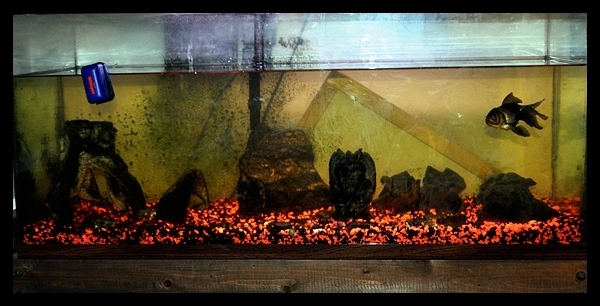 Jes being a bit of a shutterbug snapped some pictures of the tank before she cleaned it just to prove how bad it was. There was slimy algae on everything and the substrate was filled with crap (literally). She tested the water, and the nitrate and phosphate readings were off the charts. Her mission was to teach the young girl just how to care for her beloved fishy while cleaning up his current tank. On top of scrubbing the walls of algae and cleaning the filter of gunk, Jes also siphoned the gravel like mad and removed handfuls of it. She said it was at least 4 inches deep and a disgusting nitrate factory. Jes continued this routine for a couple of months. Once a week she would head to Mr Waddles’ family’s house, teach the young girl about fish, and help her clean the tank. But as young children can, the little girl lost interest in Mr. Waddles and the tank. This put Jes in a bind as she didn’t have room to take Waddles and didn’t want to leave him with a family who was known to be terrible at fishkeeping. 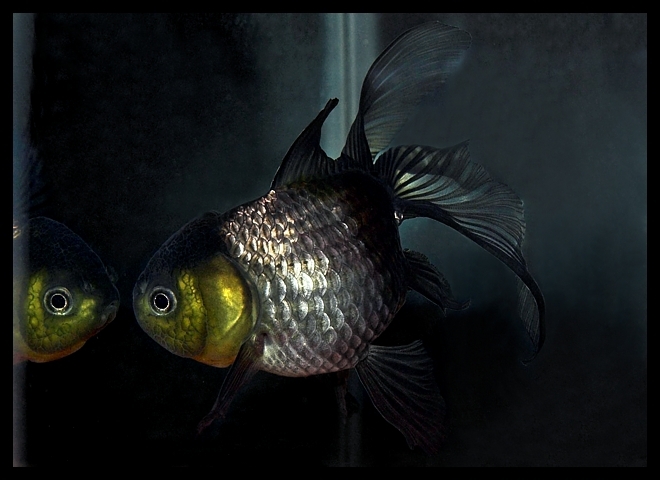 My heart melted for this adorable little oranda. I offered to take Mr. Waddles if Jes and his former family would be willing to ship him. Jes wanted to make sure the young girl knew that rehoming a fish isn’t something to be done lightly. Fish aren’t just toys you can give away when you are tired of playing with them. Eventually she agreed to give him away, and Jes and I began to make arrangements. Jes started to do 20% daily changes on Waddles’ tank to give him the best possible water to travel in. She also contacted her wonderful local pet store who agreed to pack him for shipping. This was Jes’s largest worry which was greatly assuaged by that awesome store. Less than a week before he was due to be shipped, Jes decided to bring Waddles to her house to make daily water changes much easier. She dug out an old 20 gal and set him up in a temporary position in her bedroom, much to the chagrin of her husband. As even the most well-thought-out plans go, a wrench can still make its way into them. The day Jes was to ship Waddles her children came down with the stomach flu. She couldn’t leave to ship him. The following week, I couldn’t receive him because I was going away that weekend to watch my boyfriend graduate university. I didn’t want to leave him alone just a few short days after getting him. What was supposed to be a few night’s stay at Jes’s house turned into a couple weeks. Last week, the planets aligned and Jes shipped him without incident to my house! Because of his troubled past I have him in strict quarantine for a month. If and only if everything looks spotless at the end of that month, he will join my three other goldfish in my 55 gal. Waddles is about a year old but is already stunted from his poor care. He is about the same size as my other four, and while I expect him to grow I don’t expect him to get as large as an oranda should. Waddles on day one (23 May). He was pretty skinny and very shy. Waddles after nine days (1 June). He is steadily gaining weight and cuteness. Waddles has come a long way from his cramped, dirty home. I thank Jes for giving me the opportunity to be part of this courageous story and for all the hard work she put into getting him healthy. I hope that I can send Jes and Waddles’ former family a picture of him doubled in size in a couple of years. And yes, his name is going to stay. How awesome of you to take Mr. Waddles in! Mr. Waddles is so cute I love it. Aquarium Service is such an important part of owning fish. I am happy to see that he is doing well. Thank you for sharing the photo of Hanako. I just share it to my blog also is that okay? Certainly. Just make sure to give credit!